MOBILE, AL – The Sun Belt and SEC basketball conference tournaments kick off this week, and Alabama teams are looking to make deep runs in the brackets. In the SEC, Alabama finished with the No. 9 seed. After going 8-10 in conference play, the Crimson Tide will have to play against No. 8 seed Texas A&M in their first game. Texas A&M defeated Alabama 68-66 on Saturday, but earlier in the year, Alabama took down the Aggies 79-57. The game is set to tip off Thursday at 1 p.m. on the SEC Network. Auburn ended with the No. 1 seed in the SEC, going 13-5 in the conference this season. They await the winner of Alabama and Texas A&M who they will play Friday in the quarterfinals. Auburn has not won the SEC tournament since 1985 when Chuck Person led the team to an overtime win over Alabama. 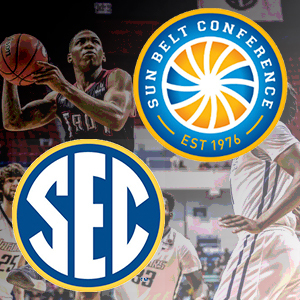 In the Sun Belt Conference, South Alabama and Troy are matched up in the first round of the tournament. Troy earned the No. 7 seed, while South Alabama ended with the 10 seed. Troy beat South Alabama in both meetings between the two teams this season. The Trojans and the Jaguars are scheduled to face off Wednesday at 5 p.m. and the game is available on ESPN3. Women’s basketball in the Sun Belt also starts this week. South Alabama finished the season with the 5 seed, and they will have to play No. 12 ULM on Tuesday at 2 p.m. The winner will face No. 4 Troy in the quarterfinals Thursday at 2 p.m.
For more information, listen to Sports Drive weekdays from 3 p.m. to 6 p.m. on WNSP.